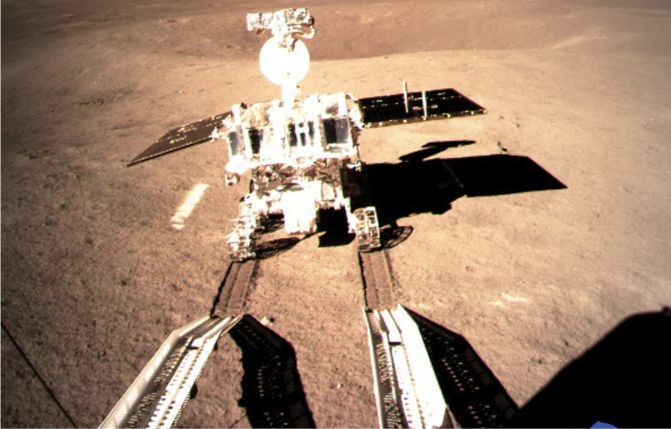 Chang’e-4’s lunar rover gets to work. China has become the first country to land a spacecraft on the far side of the moon, setting the stage for a new space race with the U.S. The unmanned Chang’e-4 probe—the name was inspired by an ancient Chinese moon goddess—touched down last week in the South Pole–Aitken basin, an ancient impact crater that’s about 1,550 miles in diameter and 7.5 miles deep. Landing on the moon’s far side is incredibly challenging. Because the moon’s body blocks direct radio communication with a probe, China first had to put a relay satellite in orbit above the moon in a spot where it could transmit signals to the craft and to Earth. The far side of the moon is of particular interest to scientists because it is heavily pockmarked with deep craters, more so than the familiar near side. Chinese researchers hope to use instruments onboard Chang’e-4 and its lunar rover to find and study areas of the South Pole–Aitken basin where the mantle—the region below the crust—might be exposed. “This really excites lunar scientists,” Carle Pieters, a planetary scientist at Brown University, tells NBC.com, “because it means we have the opportunity to obtain information about the interior of the moon and how it’s constructed.” Data about the moon’s composition, such as how much ice and other exploitable resources it contains, could help China decide whether its plans for a future lunar base are feasible.